← Before you apply: decide with the end in mind! Higher education: do the benefits outweigh the costs? I am a firm believer in higher education. You don’t only get an in-depth understanding in a specific field but you also learn many things that will be useful in a work-environment; you learn to think critically, to present your arguments in a structured way, to meet deadlines, to work in teams, to interact with people from various social and cultural backgrounds. However, these benefits come at a price and with the expected increase in tuition fees from 2012, I can even say that they will come at a really high price. So, before you apply, you need to do your due-diligence and you need to decide whether the benefits you get outweigh the costs. The situation reminds me of property investment. My father used to say ‘Invest in property, it never loses its value.’ Recent times though have shown that this statement is not entirely true. Many have seen the value of their property plummeted and they are stuck with it. Similar thinking process for higher education is needed. Higher education has many benefits and these benefits come at a price. As with any other investment, you need to do your due-diligence before you make the decision whether higher education is for you or not. And remember, you don’t necessarily need to have a degree in order to become successful. Think of Steve Jobs and Bill Gates. Korina Karampela is the founder of b4iapply, author of 2 books, consultant and speaker. This entry was posted in b4iapply to college, b4iapply to uni, Value for money and tagged apply, before I apply, do benefits outweigh costs, financial considerations, link education with career, property investment, tuition fees, what to study. Bookmark the permalink. 3 Responses to Higher education: do the benefits outweigh the costs? 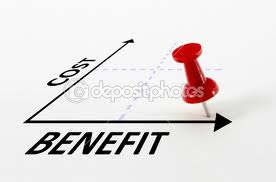 Indeed this is a fundamental question , do benefits outweigh the costs? This question holds true not only at the micro level ( individual) but is of great importance at the macro level (society). Are the benefits of state-provided education higher compared to the costs of delivering education? To the extent that education can be seen as a platform for social mobility , and why not an income redistribution mechanism should it be offered ” for free” at the point of access – the only criterion for entry being merit? If the benefits outweigh the costs at a societal level ,shall it be offered for free to everybody? And if yes ,can we afford it as a society? If higher education comes with a price tag how do we ensure that deprived members of the society can have a fair chance to enroll in higher education institutions ?